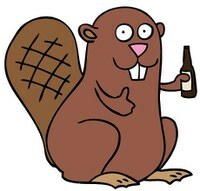 You are here: Home / Hashes & Events / Pinelake April 7: National Beer (and Beaver) Day Hash! Saturday! Saturday! Saturday! Come hash Pinelake! Info: The rain should end in the morning and everyone needs to celebrate National Beer Day (and International Beaver Day)! Meet up at 2:00 for a 2:30 start. There will be hot bean dip!